The importance of portable document files in soft mode cannot be under-estimated. This format of files has been specifically designed to keep up with the fast-paced and highly demanding workload for people who are working in offices or are constantly traveling. Although there are many PDF software converter programs in the market, PDFelement 6, the edit pdf free software marketed by Wondershare Software Ltd., has emerged as one of the leaders in the world. I had to talk about “Edit ” feature when I mentioned PDFelement. The deepest impression about PDFelement 6 that is smoothly edited capability, there is no problem to edit PDFs like Word. Unlike other software in the market, this pdf editor software offers amazing editing features such as text, pages, and images among the others. Not only that, but the software also offers various other features such as strikeout, highlight, underline text, add custom stamps and notes among the others. Further, with this software, the user can not only extract a section of pdf files and save it separately. As part of editing software, it also offers various facilities such as permanent removal of sensitive images and texts from the pdf file and sends to its destination. This software is powerful PDF creator as it creates PDF from other file formats such as MS Word or RTF files at a faster speed. Although the output retains the original layouts, it becomes easy to modify and repurpose these documents. Not only that, if the user is in a hurry, he or she can create several PDF files in a batch. The use of this software saves a lot of time and effort that the user can expand on any other task. PDFelement can be defined primarily as all-in-one PDF editor that include many innovative features, for example, it can create, edit, and convert, various type of file formats in a matter of minutes. Not only that, but it also enables the user to convert files using OCR facility in various batches. The user can also fill up PDF forms without any extra efforts. Other than that, this software also offers many facilities that include annotation, password protection, and digital signature, insertion of header and footer into the pdf file and splitting and merging of any kind of pdf files as per the requirement of the user. It is a fact that every person during the course of work or study needs to convert software files from one format to the others. This is due to the fact that every file format requires different software and it is not easy to get them due to its cost. This software offers a necessary service that includes conversion of different file formats into the PDF and vice versa. This software supports a wide range of file formats such as word (.doc and .docx), excel, ppt, Rich text format (RTF) and Kindle (.mobi). What’s more, Its' powerful batch process have capability to convert PDFs in one second. OCR or Optical Character Recognition plays an important role in commercial and governmental work today as it is widely used as an information entry from the printer paper data records such as invoices, business cards, bank statements among the others. The PDFelements software offers the latest version of OCR, a common method of digitizing printed texts for its users. 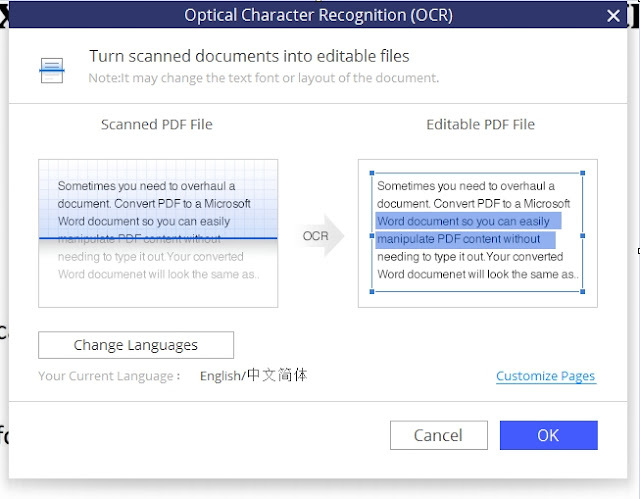 With this feature, you can convert scanned (image) PDF into fully searchable and editable PDF with OCR. With this feature, the user can digitalize their records and contribute their share in eco-friendly society. This is a very useful feature for the users who would like not only to digitalize their record but also like to edit, search and take them everywhere with them. Also, you don’t need to worry if you are not from an English country, The OCR of PDFelement 6 supports 25 languages. It is a fact that there is only one constant in the world and that is change. This fact is even true regarding any software. The research and development team of the organization continue to come up with more user-friendly features at the regular intervals. The new version of this software offers new features such as paragraph editing, text autofit, save multiple PDF pages as one image and spell check the pdf files among the other innovative features. The new version of this software offers new features such as create fillable PDF forms, export form data into Excel/ from scanned PDF.ect. As the use of PDF file format continues to increase all over the world, PDF converter software’s popularity is on an upswing. Although there are many PDF software in the market that offer creation and conversion, the features and facilities offered by PDFelement View cannot be compared with any other software in the market. Updated on June 2017 - Latest version of PDFElement is available.